Ours is a digital world. Smart and wearable tech — now generating tens of billions in annual sales — is transforming the way people work. Many companies, in particular those with the courage and clarity of vision to peer into the future, are now dedicating considerable time and resources to leveraging technology to offer employees better experiences. It’s no longer a question of if the workplace will change, but whether a company’s commitment to innovation will be sufficient to keep it ahead of the competition. Data is at the very heart of a company’s transformation into a digital enterprise. An essential part of “going digital” involves saying goodbye to old practices and processes, especially when it comes to documents. However, many businesses that want to digitally transform are not sure how or where to start doing so. These enterprises should look at document scanning. The DX process, after all, — evolving from an enterprise built on the iffy foundations of intuition, luck, and educated guesses to one built on hard, cold data — begins with document scanning. Document scanning turns your documents into data — always accessible, always instantly retrievable data. And it’s just the beginning of a wider process of becoming more intelligent, more data- and fact-driven, and more agile, leveraging data to make smart decisions for the benefit of the organization. There has never been a more urgent need for intuitive, connected technology that seamlessly blends market-leading hardware with innovative software. Without it, the setup of key software components sacrifices productivity and satisfaction, creating roadblocks that can result in customer dissatisfaction. With it, the potential for your clients to excel in the workplace is unlocked, ultimately establishing a powerful relationship with you. 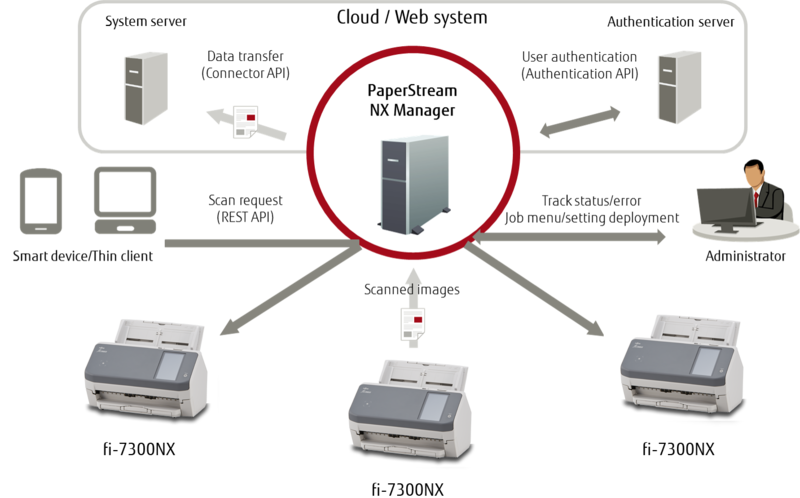 With its centralized management system, Fujitsu fi-7300NX document scanners are flexible, and can connect an entire organization, increasing productivity and strengthening collaboration. The fi-7300NX creates a custom, centralized network, with intuitive integration as well as state-of-the-art hardware and access to a gateway of innovation. With technology advancing at a staggering pace, the time is now to offer a custom, centralized management system. Your clients’ businesses need fully customizable solutions for peace of mind, so they can focus on delivering the best for their organization. Fujitsu’s fi-7300NX is the future-ready refresh that your clients have been waiting for. Learn more about the fi-7300NX.